Watch viral video of a huge waterspout in Malaysia. It damages approx. 50 houses in Tanjung Bungah Park. 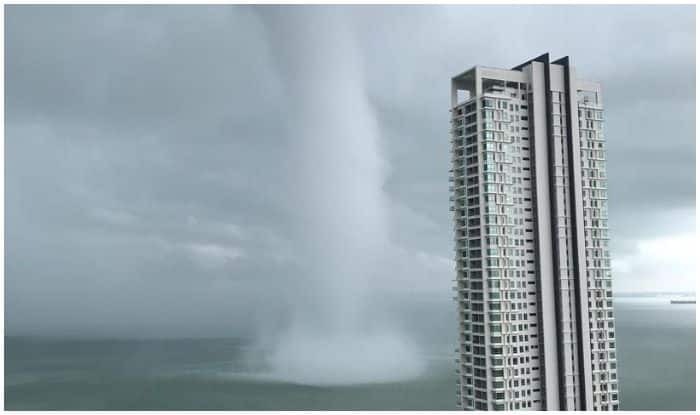 Due to climatic changes happening across the world, one such unusual weather phenomenon ‘waterspout’ occurred in Malaysia. A video has gone viral which shows a huge waterspout making landfall in Tanjung Bungah, Malaysia, on April 1. It looks like a mini tornado, close to the coast of Tanjung Bungah Park. The eyewitnesses said that it swept along the coast, gradually decreasing in speed as it turned towards the island. According to Accuweather, the wind speed around the area exceeded 20km/hour, with thunderstorms expected across Penang. The viral video showcased how the waterspout moved from water to islands and damaged at least 50 houses. As per reports, no one was seriously injured with this rare waterspout. Residents took to social media to share images of their close encounter with the unusual weather. A waterspout is an intense columnar vortex, usually seen as a funnel-shaped cloud that occurs over a sea. They are associated with severe thunderstorms and are often accompanied by high winds and seas, large hail, and frequent dangerous lightning. According to NOAA’s National Weather Service, the best way to avoid a waterspout is to move at a 90-degree angle to its apparent movement. Never move closer to investigate a waterspout. Some can be just as dangerous as tornadoes.